How does the Virtuemart Plublishing function work? It is not possible to create this addition as a Joomla Plugin to alter the Virtuemart core files since this is adjusting a few Virtuemart core files. However, integration is very straight forward. The main purpose of the plugin is to create the necessary SQL tables in your database. Instead of manually trying to create these additional columns through PHPMyAdmin we have put together a plugin to do it for you. Simply install as any other Joomla Plugin. Once the plugin has been installed and a few files editing you will be able to use automatic publishing settings for each individual listing. If you a have any problems please contact us and we can be contracted to do this for you. 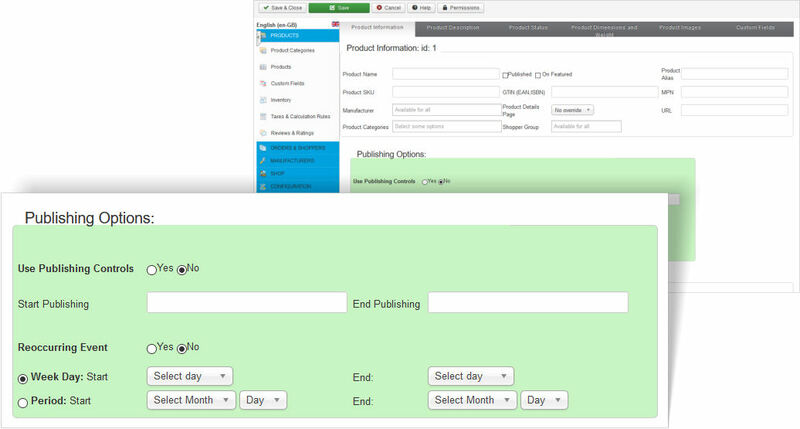 Creating a schedule of WHEN and WHEN NOT to publish a product or service, is now as easy as choosing a date. Virtuemart Ecommerce is not just for listing a product. It has been adapted across multiple industries as a reliable, scalable and affordable solution to solve problems. Our admin tool works by installing a plugin, editing a few Virtuemart files, and then controlling when to publish a listing. All the publishing options are intuitively contained inside the details of the listing. You do not need to navigate away from the listing you are creating to control the publishing criteria.